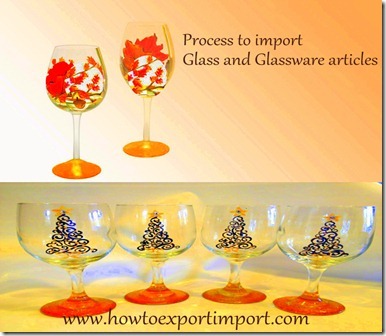 The information provided here is to provide basic guidelines to import glass and glassware products. If you import any materials, accurate information from necessary government agencies of importing country may be collected. Conditions as per Hazardous Wastes management, handling and Trans boundary movement rules. Each country has their own foreign trade policy to import Glass and Glassware materials in to their country. However, most of the countries have Hazardous wastes management, handling and tans boundary movement rules or similar authority that regulates imports and consumption of Glass and Glassware materials in their country. Any importer who would like to import Glass and Glassware materials should follow the terms and conditions of such hazardous wastes management, handling and Trans boundary movement rules before actual import of Glass and Glassware materials takes place. Almost all countries have environment department to regulate importation, consumption and usage of materials effecting environment. Permission from such environment department of importing country is essential to import some of the items under Glass and Glassware materials. In India, Ministry of Environment and Forest (MOEF) is the authorized government agency to regulate such materials including importation. Test report of analysis from Laboratory to import Glass and Glassware products. For the purpose of importing Glass and Glassware materials, the importer must obtain a test report from accredited laboratory authorized or governed by importing country is required. Necessary sample of imported Glass and Glassware materials is drawn as per the procedures and rules of importing country and submits with such authorized laboratory and obtains analysis report. Normally three sets of samples of importing Glass and Glassware materials are drawn and forwarded to laboratory notified by environment and forest department. Test report retains for minimum two years to confirm on obligation fulfillment by importer on importation of Glass and Glassware materials articles. Such certificate is submitted with customs location of importing country to process importation of Glass and Glassware materials. If non fulfillment of obligation by importation of Glass and Glassware materials, the importer should re-export the hazardous waste within 90 days from the date of arrival in to importing country as per hazardous waste management, handling and trans boundary rules. If any of the imported Glass and Glassware materials are not followed the necessary norms of importing country, such imported Glass and Glassware materials have to be destroyed or to be removed out of importing country. Such non compliant imported Glass and Glassware materials may be also fined by imposing penal charges, apart from destruction or return to origin country. Some of the importing items under Glass and Glassware materials importing from some of the countries attract anti dumping duty. The reason for imposing anti dumping duty is for rectification of trade distortive effect of dumping and re establishes fair trade. World Trade Organization WTO members as per GATT (General Agreement on Tariff and Trade) permit their member countries to take individual decision on imposing such anti dumping duty to ensure fair trade rather than protecting domestic industry. Some of the items under Glass and Glassware materials fall under RSP based valuation to estimate import tax. CVD is calculated on the basis of RSP based valuation to determine import duty. RSP means retail sale price. Retail Sale Price RSP means the maximum price at which the excisable goods in packaged form may be sold to the ultimate consumer and includes all taxes local or otherwise, freight, transport charges, commission payable to dealers, and all charges towards advertisement, delivery, packing, forwarding and the like, as the case may be, and the price is the sole consideration for such sale. Registration to act as an Importer: Government registration is required to become an importer in the country to act as an importer. Foreign Trade government office of respective country is responsible to issue such authorization to become an importer. In India, IEC number (Import Export Code Number) is obtained from the office of Director General of Foreign Trade office to operate as an importer and exporter in India. Registration procedures to act as an importer are a onetime process, but renewal may be required as per the terms and conditions of such foreign trade office of a country. In most of the countries, the information on such registration for importer – exporter is linked with customs location and reserve bank, as process of imports and exports are online digitalized. So the importer of Glass & Glassware is also required to contact concerned government agencies of their importing country to verify whether such onetime registration is necessary or not. Procedures to import: As per the mutual agreement between buyer and seller, the import shipment is taken place. Pricing, quality specifications, terms of payment, terms delivery, mode of transport and other terms and conditions are agreed and mentioned in purchase order and import shipment of Glass & Glassware is effected accordingly. As you know, under any importation of goods, necessary import documentation and customs clearance procedures at importing country have to be completed either importer’s customs broker or importer directly as per foreign trade policy of respective importing country. For importing Glass & Glassware also, import entry documents along with carrier’s document (Bill of Lading /Airway bill), commercial invoice, packing list, certificate of origin and other required documents are filed and necessary import procedures are completed to take delivery of imported goods under Glass & Glassware. Nowadays, necessary information is filed online and produces required documents at the time of inspection, assessment or delivery of import of goods at destination customs location. The international partners of countries share quality measures each other and exempt from multiple inspection on same products both for export and import. However, as per the policy of most of the developed countries import of goods from Least Developed Countries (LDC) need to be certified by authorized agencies before export. So, if any import of Glass & Glassware takes place, the details of such information can be obtained from necessary government agencies of importing country. Certificate of Origin to import Glass & Glassware: The source of origin of imported Glass & Glassware is required in almost all countries. So a certificate of origin issued by necessary approved authorities at exporting country is required to import Glass & Glassware. Certificate of origin helps to determine origin of imported goods to avail exemption on import duties and taxes. Different unilateral, multilateral and bilateral agreement between countries also allows imports and exports with exemption of import duties where in Certificate of Origin is the primary proof on country of origin of importing goods under Glass & Glassware. The countries each other may have bilateral, multilateral and unilateral agreements which exempt documentation and rates of import tax and duties. The importers have to collect accurate information from necessary government agencies before import of Glass and Glassware materials. In this article, the documentation, process and formalities to import Glass & Glassware are explained. As explained above, this information is generally applicable for all countries to import Glass & Glassware. These details on how to import Glass & Glassware are given to provide a basic idea to bring vegetables from foreign country. Specific requirements for each importing country need to be followed by importers and exporters of Glass & Glassware. Have you satisfied with this post about basic information on documentation, procedures and formalities in importation of Glass and Glassware? Would you like to comment your thoughts on this article about importation of Glass & Glassware? Share below your experience in importing Glass & Glassware from overseas country. Import guidelines to foreign buyers of lamps and lanterns. How to import glass woven fabrics? What are the procedures to import founts for kerosene wick lamps? Import clearance formalities of globes for lamps and lanterns, Tips to importers of woven fabrics of roving. Processes to import glass thin sheets, Can I import parts of glass mats, Is import of glass fibres permitted?, Import clearance procedures of silvers, rovings, yarn and chopped strands, Import documents require for glass microsphere, Customs procedures to import glass statues, How to import bangles?, Processes to import glass beads, imitation pearls, imitation precious, Licenses required to import graduated or calibrated laboratory glassware, Government rules to import laboratory, hygienic or pharmaceutical glassware, Tips to overseas buyers of glass for sun glasses. Government licenses required to import glasses for corrective spectacles, Methods to import glass cubes and other glass small wares. Ramesh BH: On 05 August 2016 We are planing to import the material from china,we don't Know how is that so can you help us about the custom clearance and transportation? sumit: On 08 October 2016 I want import of glass product.... So how can? And what's price? Jerry DeMary : On 20 November 2016 I represent an American company that wants to import glass products from India to the U.S. Do you have the expertise to help us navigate the rules, regulations, tariffs etc. associated with these transactions? salim shaikh: On 13 May 2017 glass scrap import under special import licence ?